Edibles can fit right in amongst the ornamentals in a front yard. When I grew up in southeast Portland in the 1950s and ’60s, my parents grew plenty of food in our yard. The parking strip in front of our house supported apple, peach, pear, plum and quince trees. The backyard held a full size cherry tree that boasted sweet fruit, provided comforting shade and supported both a swing and a treehouse. Chives, garlic and Mediterranean herbs edged the rose beds. On the sunny south side of the house, rows of crops produced an abundant harvest of summer vegetables, berries and other fruit. Rambling vines covered arbors and pumped out crops of both kiwifruit and hops. We harvested and ate the food, preserved it and shared generously with neighbors and friends. Nothing was wasted. When all useable food had been retrieved, eaten fresh, canned, frozen, dried or brewed, the remaining peels, pits and other organics went back outside to the brick bin where it magically became rich, dark compost. In 1982, Rosalind Creasy advocated for this kind of lifestyle in her groundbreaking book, The Complete Book of Edible Landscaping. In the decades since, many things have changed. 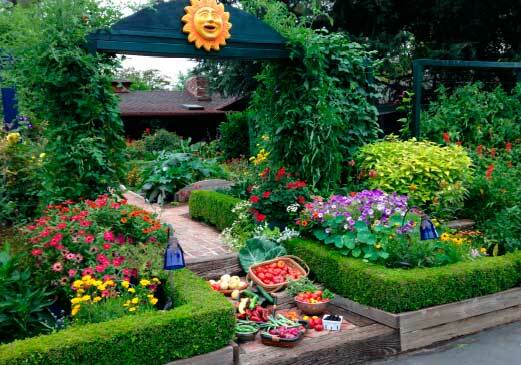 For example, we don’t call it simply “gardening,” but “foodscaping” now. But some things remain the same. People still need to feed themselves and their children. Growing your own food still benefits both health and pocketbook. And most people agree that the best foods are fresh, flavorful and locally sourced. 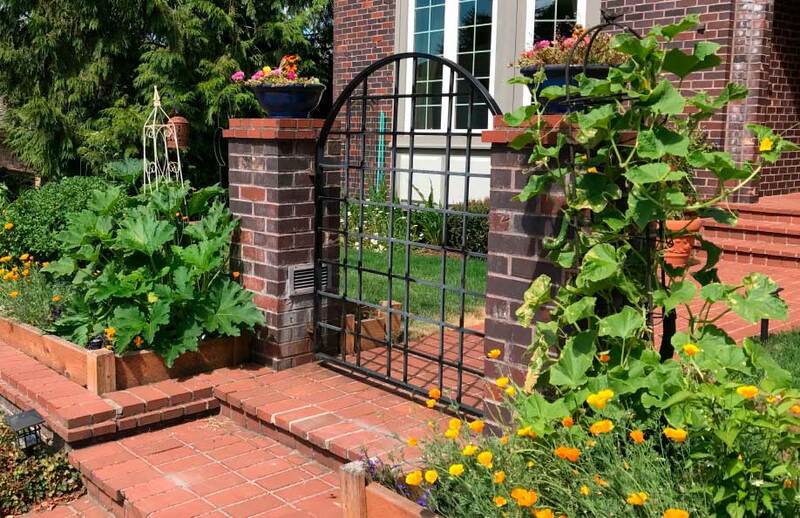 As food plants have made their way into the front yard, Creasy has continued to inspire others about the beauty and benefits of growing food. She reports that, in her area in California, the leaders of Silicon Valley are promoting food gardens to benefit their employees. The CEOs of Adobe Systems and Google even had Creasy give presentations on growing food. “Both companies have provided space for food gardens to supply produce for their cafeterias and for the employees to have their own plots,” Creasy said. The new Apple Park, headquarters for Apple Inc. in Cupertino, California, also includes edibles in its landscape plans. What does this mean for ornamental horticulture, an industry that took a significant hit during the recession of 2008–09? It offers a way for growers and independent garden centers to redefine the roles they play in their communities. Evidence shows that young people want to feed their families fresh, nutritious food that has been grown sustainably and close to home. As a result, grocery stores are offering an increasing array of organically grown, plant-based and heirloom products. Farmers’ markets and CSAs are booming. People are finding ways to plant and grow their own. “The industry needs to be relevant to thrive,” said foodscaping proponent Brie Arthur, speaking at this year’s Farwest Show. Doing that led to a bigger focus on food that has become a year-round, locally based business model. The garden center, now more relevant to the community, has enjoyed increased traffic and off-season cash flow. “[We became] the food place in town and the expert on growing food,” Monroe said. A weekly, year-round Farm to Table marketplace brings together a diverse line of niche/gourmet products from local vendors. CSA farm shares drive three cash flows during winter, and during the summer, when members come to the garden center to pick up their produce, they frequently pick up plants too. Adding the CSA increased summer traffic at the garden center by 2000 percent. Greenbrier is also experimenting with growing gourmet microgreens that are ready to harvest in three days and converting greenhouse space to food crops. Tomatoes, cukes and peppers grown in three-gallon pots have a three month growth cycle as opposed to a three year production cycle for shrubs, Monroe pointed out. PR and marketing firm Garden Media Group has identified growing edible plants as an important trend for several years, and spokesperson Katie Dubow expects that this trend will continue in 2018. Changing attitudes about health are driving interest in growing and eating plants: people are choosing more plant-based foods and they view gardening as a boost to mental health. “Whether indoors or out, a new wave of concerned citizens, especially millennials, are eating more plants for better health, both for themselves and for the planet,” Dubow said. The overall theme of the GMG’s 2018 Trends Report — Nature’s Rx: Mental Wellness — acknowledges rising concerns about mental health, especially anxiety, and the fact that growing and being around plants can benefit mental health. Young people “will be growing plants as a way to balance physical and mental wellness and clear their heads,” Dubow said. Those steering away from meat are now starting to grow edibles rich in protein at home, so GMG identified ‘Grow Your Own Protein’ as a specific new direction for 2018. Another expected 2018 trend identifies purple foods and plants as taking center stage for both beauty and health benefits. According to the USDA, Dubow said, purple antioxidants, called anthocyanins, help fight cancer, have anti-aging benefits, reduce obesity, and protect the heart. And purple food promotes mental strength too. People will be using purple herbs like lavender, catmint and rosemary and replacing ornamental shrubs with blueberry and blackberry plants, Dubow predicted. Long term proponents of growing food include devoted purveyors of seed and growers of fruiting plants who have expanded choices for growing food, bringing back flavorful heirlooms, researching best options for specific growing conditions and introducing a wide range of exciting international flavors. “Eating never goes out of style,” pointed out Renee Shepherd, owner of Renee’s Garden Seeds in Felton, Calif. (www.reneesgarden.com). Widely regarded as a pioneer in introducing international vegetables, flowers and herbs to home gardeners and gourmet restaurants, Shepherd dates her seed sales to 1985. Searching out the best seed sources, testing new plants in her own gardens, developing and sharing recipes with gardeners, Shepherd promotes a “Garden to Table” line of seeds. Available only at independent garden centers, Renee’s seeds appeal to home gardeners who like to cook. The entire line of non-GMO varieties has been selected for great flavor and easy culture from seed producers all over the world. Cook-gardeners appreciate uniquely flavorful choices like heirloom Chioggia striped beets from Italy and Gladiator parsnips from England, Shepherd said. Cilantro overtook basil as Shepherd’s top-selling herb this year as tacos and salsa have become mainstays in American culture. Shepherd also specializes in compact varieties, like French zucchini Astia that was bred for container growing. A line of flower seeds selected for color and performance attracts pollinators and beneficial insects to enhance edible gardens too. Jim Gilbert, owner of wholesale Northwoods Nursery in Molalla, Ore. (www.northwoodsnursery.com) has been growing fruiting plants since 1979 and he has traveled the world to bring unusual international produce to market. 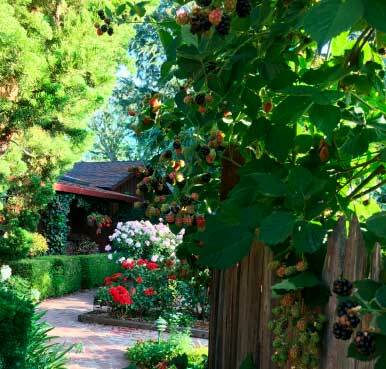 Moving to the nursery’s current location in the Willamette Valley in 1982 allowed Gilbert to start growing figs, pineapple guavas and fuzzy kiwis, among other sub-tropical fruits. When he began traveling to the former Soviet Union in 1990, he brought back sea berry, honeyberry, Cornelian cherry, schizandra vine and unique varieties of quince and olive. Currently, trials with 2,400 sea berry seedlings are underway at the nursery as Gilbert seeks improved forms of the fruit that is popular in Eastern Europe, Russia and China. A potentially valuable plant for American gardeners that is prized for large clusters of bright orange-yellow berries, sea berry fruit is very high in Vitamins C, A and E, and its tart juice, when sweetened, makes a delicious drink. Selling mostly to mail-order nurseries, garden centers and re-wholesalers, Gilbert offers container plants in #1s, rooted cuttings and one-year-old bare-root fruit trees. He offers dwarf, compact and columnar fruiting plants as well as ones with good disease resistance and health benefits. “We have always been a Northwest nursery,” Gilbert said, “focused on fruiting plants that will grow and produce fruit in our unique climate. We search for easy-to-grow varieties that require little or no spraying. Elizabeth Petersen writes for the garden and horticulture industry. She can be reached at gardenwritewl@gmail.com.